There’s an odd disconnect between what’s in the PR email and on Roku’s site. One says Canada, the other seems targeted to the US. I don’t know if they’re [poorly] geo-targeting my UK IP or just got their PR wires crossed. Either way, it’s nice to see more options available for the best OTT platform out there. Today we’re excited to share that the first 4K UHD Roku TV models are available for purchase today. Three 4K UHD Insignia Roku TV™ models are available exclusively from BestBuy.com beginning today and in Best Buy stores nationwide early next month. 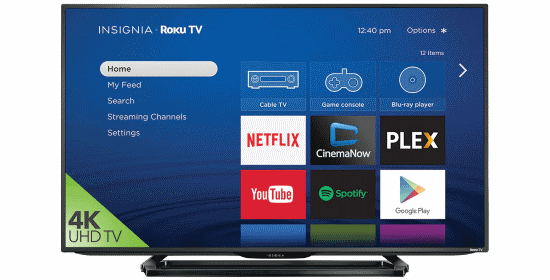 As with all Roku TVs, the 4K UHD Insignia Roku TV models feature our award-winning Roku® operating system (Roku OS) that provides a simple smart TV experience with a personalized home screen and access to more than 3,000 streaming channels, including 10+ streaming channels that offer 4K UHD content. Axiim announces 4K Q, will upgrade existing users FOR FREE!